Map of Old Town Key West, including Duval St and the "party district". Many prime landmarks are identified. Map of the entire island of Key West. Note that this is a pretty big file and map. If you decide to stay in Key West, you might need a job. 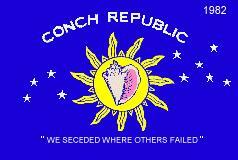 I got this ad out of the Key West Citizen when I was down island. I've created an interactive map of Key West bars and landmarks using Google Maps. Google Maps now has Key West Street View! You can actually simulate walking down many of the streets in Key West. The link I have provided will put you on Duval St heading south just south of Front St. Hogs Breath Saloon is just to your right. You can drag the picture to take a peak over at the Hogs Breath Raw Bar. Click on the arrows and guides in the upper left to navigate around, and use your mouse to drag the picture to look around 360 degrees. Google Maps now has great imagery of Key West. Key West Webcams - Watch live video with sound of some of my favorite Key West landmarks. Hog's Breath Saloon - My favorite bar in the entire world. I've spent many a day here...all day...at the raw bar. They always have good music, good food, good bartenders, and good company. You never know what you will see and who you will meet. Smallest Bar in Key West - This bar is literally no bigger than a small bathroom, but as you can see, it rocks! I've had some great times there as you'll see in this video. Atlantic Shores Resort, where clothing is optional. Note: Atlantic Shores, a Key West Landmark, has been bulldozed to make room for a luxury resort, but I am leaving this here in memory of Atlantic Shores Resort, a Key West icon. 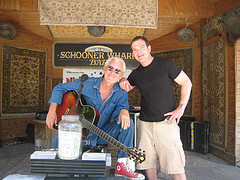 Whatever you do, don't forget to check out Michael McCloud at the Schooner Wharf Bar. He has lots of awesome original music and does tons of other stuff as well.